Designed to be used by police, gendarmerie, customs and security services, the Deveryware solution can be used to automatically monitor identified targets through the exploitation of real time tracking of mobile phones and GPS beacons. Designed for States and their interministerial operational crisis management centres, for town halls and businesses who need to make mass real time notifications to population groups in a crisis situation, Deveryware provides alert solutions to targeted populations, adapted to these needs. 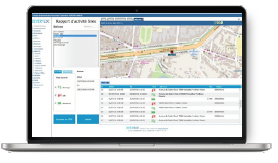 Designed to be used by police, gendarmerie, customs and security services, the Deveryware solution can be used to automatically monitor identified targets through the exploitation of real-time tracking of mobile phones and GPS beacons. Integration of complementary data: detailed billing, reading of licence plates, PNR, etc. A national platform for exploiting geolocation data connected to each telephone operator in the country. Users can access the various mobile phone tracking services and fleet management using secure applications available on PC and mobile devices (IOS & Android). all levels of information, instructions, standard messages, pictograms etc. An operational platform that uses geolocation data adapted to all use cases.